What can you get with RM300,000 in the Klang Valley? Scanning the sale listings on EdgeProp.my, we searched for 3-bedroom non-landed residential units with asking prices at RM300,000 and below. We also assumed that you would be able to pay an estimated monthly instalment ranging between RM1,000 and RM1,330 — that is, if you get a 30-year mortgage with 90% loan margin at an interest rate of 4.25%, which is generally considered affordable for the majority of wage earners with a monthly income of RM3,500 and above. Location, accessibility and proximity to amenities as well as the building condition and its facilities are usually a buyer’s main considerations, hence we tried to take those factors into account in our search. 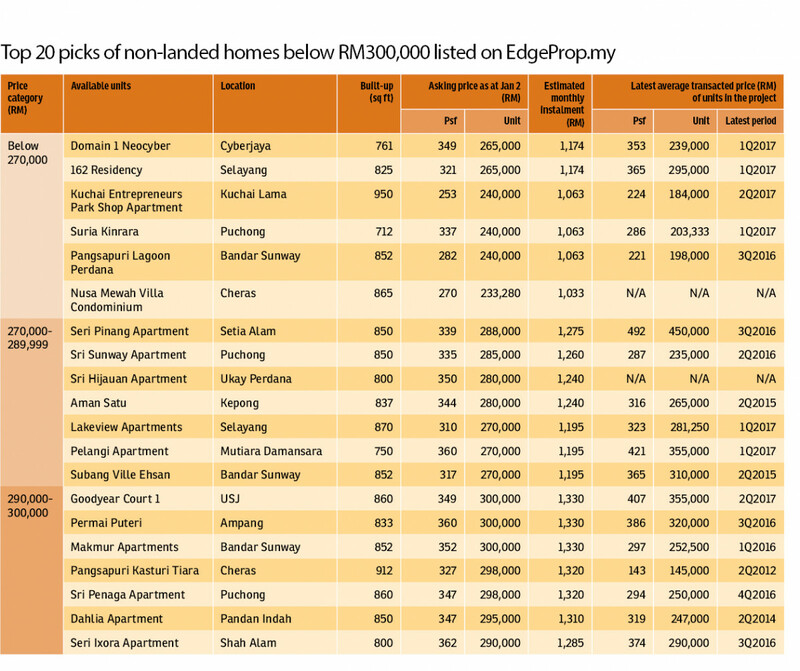 We ended up with what we thought were 20 of the best listings of non-landed homes of below RM300,000 on EdgeProp.my as of Jan 2, 2018. Of the 20 listings, six of them were asking for below RM270,000! There is a unit in Domain 1 @ Neocyber in Cyberjaya (761 sq ft), a unit at 162 Residency in Selayang (825 sq ft), a shop-apartment unit at Kuchai Entrepreneurs Park in Kuchai Lama (950 sq ft), a unit in Suria Kinrara in Puchong (712 sq ft), a unit in Nusa Mewah Villa Condominium in Cheras (865 sq ft) and a unit in Lagoon Perdana Apartment in Bandar Sunway (852 sq ft). Their built-up sizes range between 712 sq ft and 950 sq ft, and they come with facilities like swimming pool, car parks and community hall. Out of the six projects that were asking for below RM270,000, the unit at Nusa Mewah Villa Condominium has the lowest asking price psf of them all, at RM270 psf for a 3-bedroom unit of 865 sq ft.
Nusa Mewah Villa Condominium is a leasehold condominium completed in 2014. Sitting along Jalan B/P 4 in Taman Bukit Pandan Cheras, it consists of two 15-storey blocks that house 360 condo units. For those with a higher budget, there were seven properties with asking prices of above RM270,000 but below RM290,000, offering built-ups ranging between 750 sq ft and 870 sq ft. These units were in Seri Pinang Apartment in Setia Alam (850 sq ft), Sri Sunway Apartment in Puchong (850 sq ft), Sri Hijauan Apartment in Ukay Perdana (800 sq ft), Aman Satu condominium in Kepong (837 sq ft), Lakeview Apartments in Selayang (870 sq ft), Pelangi Apartment in Mutiara Damansara (750 sq ft) and Subang Ville Ehsan condominium in Bandar Sunway (852 sq ft). The unit at Lakeview Apartments has the lowest asking price psf of the seven properties, at RM310 psf for the 870 sq ft 3-bedroom unit. The leasehold project comprises four blocks and was completed around 2013. For prospective homebuyers who are able to afford a monthly instalment of slightly above RM1,300, there are another seven properties with built-ups ranging between 800 sq ft and 912 sq ft that are asking for between RM290,000 and RM300,00. These properties are at Goodyear Court 1 in USJ (860 sq ft), Permai Puteri Apartment in Ampang (833 sq ft), Makmur Apartment in Bandar Sunway (852 sq ft), Pangsapuri Kasturi Tiara in Cheras (912 sq ft), Sri Penaga Apartment in Puchong (860 sq ft), Dahlia Apartment in Pandan Indah (850 sq ft) and Seri Ixora Apartment in Shah Alam (800 sq ft). With an asking price of RM327 psf, the unit at Pangsapuri Kasturi Tiara has the lowest asking price. Completed more than 15 years ago, it is a freehold 5-storey apartment project located at Jalan Kasturi in Cheras, Selangor. This goes to show that affordable properties are available on the secondary market in the Klang Valley, notwithstanding the fact that you would still have to do your research and physically check out the place before committing. It is possible that it could be a case of “too good to be true” or “you get what you pay for”.